Takara is a quiet, mysterious character. He is also somewhat of a ventriloquist. He hasn't talked much, and when he does, it's usually through ventriloquism. He is short, only slightly taller than Konekomaru, and wears the typical True Cross Academy uniform. 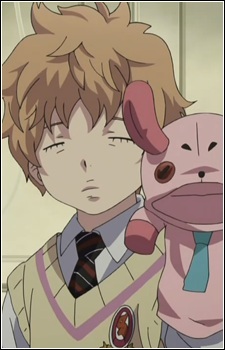 Has yet to be shown opening his eyes and is always seen with his rabbit puppet. Not much is known about him. He also did not contribute to the group effort in the Exwire exam. However, when he speaks with his rabbit puppet, the voice and tone is usually very rude.